I’m a big fan of film adaptations of Dennis Lehane’s novels and short stories – Gone Baby Gone, Shutter Island, Mystic River. Add The Drop to the list. 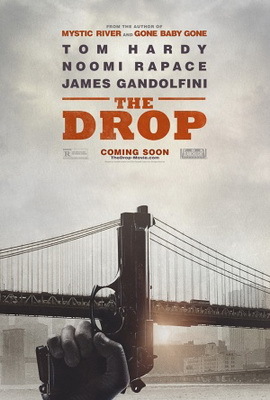 A much smaller film in scope than the others, The Drop is filmed primarily in a bar and a couple of Brooklyn streets. The threat and dread of violence simmers beneath the surface of this crime drama, but it is the dialogue (and Tom Hardy’s performance) that is the highlight – the first to be adapted for the silver screen by Lehane himself. The Drop also marks the English-language debut of award-winning Belgian director Michael R Roskam (Bullhead – nominated for 2012 Best Foreign Language Film Oscar). It’s an auspicious debut.